Honour, mateship, courage, sacrifice, respect and valour are simply just a few descriptions of our Soldiers and Armed Forces and for displays of remembrance a sculpture representing this proud service, an Australian 'Digger' soldier statue often conveys meaning and sentiment that words may fail to convey. In sculpting Digger statues in various stances and heights, World War 1 style and World War 2 style, J.H. Wagner & Sons allows for the tradition of using a statue to represent those we honour in a form which endures the extremes of weather, allows for the person of honour to be represented in a body form and demonstrates respect from the community. J.H. 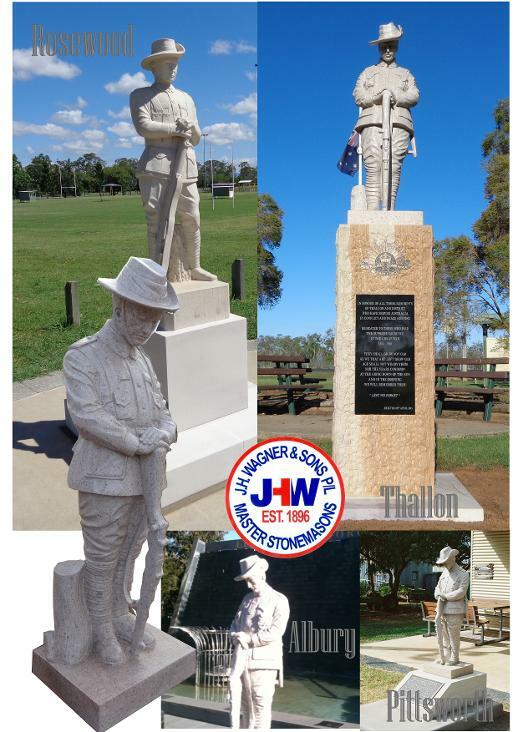 Wagner & Sons also offers a Bronze Australian 'Digger' statue in World War 1 uniform.Displaying just a few of the memorials supplied by J.H. Wagner & Sons are images of Albury RSL (Digger statue supply only), Emu Gully ANZAC Memorial, Pittsworth, Thallon and Rosewood War Memorials.